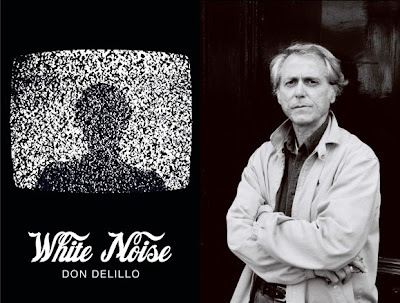 Retro Review: Don DeLillo's "White Noise"
Home » books » ebooks » retro review » Retro Review: Don DeLillo's "White Noise"
As the cloud hangs low creating a dull British August bank holiday, there seems an appropriateness to writing a review of White Noise. For a long time, I have been plagued by the occasional bout of crippling fear when it comes to considering death. This is the central preoccupation of DeLillo's novel. I downloaded the book some time ago, having read Falling Man and Cosmopolis, greatly enjoying DeLillo's original, insightful style. I was prompted to finally pick up White Noise having seen it listed in The Novel Cure as a remedy for existential anxiety, which isn't to say that I'm having a difficult period. In fact, any sense of impending doom is being successfully kept at arms length. Nevertheless, reading about a character such as Jack Gladney, who cannot overcome his fear of death, is infinitely comforting. Gladney, a college professor and the leading academic in Hitler studies has a large family, comprised of Babette, his fifth wife and a brood of children and step children. When the town in which they live is subjected to the fallout of a chemical spill, Jack's mortality is revealed all too clearly when he is exposed. Uncertain of the precise effects this chemical has on the human body, Jack is left knowing he is dying, albeit slowly. What he doesn't realise is that Babette is also struggling with existential anxiety, willing to jeopardise her health and her marriage for the sake of banishing her fear of death forevermore. White Noise is an exceptional novel, succeeding in addressing themes as far-reaching as consumerism, media saturation, and conspiracy theories. Altogether, these combine to create a picture of what creates existential anxiety in the modern world. The repeated scenes in the supermarket seemed especially apt to me; the bright fluorescent lights and endless products somehow bringing to light our own mortality through its hollowness. I hate supermarket shopping partly for this reason, associating it with a deeply ingrained formless depression. Who should die first? Is it better to lose a loved one and live? Is it ok to feel relief when someone we know dies, relief that it isn't us? These enduring human questions are precisely what give DeLillo an automatic place amongst my most treasured authors. These are more or less the remarks I made at the American Literature Association conference in Boston in May, 2013 with the exception of some improvisation I injected concerning Bosley Crowther, Manny Farber, and Sam Peckinpah and what I believe their works can contribute to understanding DeLillo. I also used graphic examples from the films of Tarnatino and Kubrick to illustrate how auteurs repeat images from film to film.